After falling in the Summit League Tournament final to rival South Dakota State and failing to get an at large bid for the NCAA Tournament, things seemed bleak for the Coyotes. It was a Women’s National Invitation Tournament berth that saw USD host the majority of their games that sparked the team. USD opened the tournament at home against Creighton with a 74-68 win over the Jays. In the Coyotes’ lone road game, they defeated the University of Minnesota 101-89 before returning home and beating the Western Kentucky Hilltoppers 68-54. In the WNIT Final Four against Oregon, the Coyotes dominated the Ducks 88-54, as they shot 54-percent from the field and 71.4 percent from three-point range. This game also included then senior Tia Hemiller’s now famous half court three. The Coyotes wrapped up their quest for a WNIT title against Florida Gulf Coast, with a 71-65 win over the Eagles. 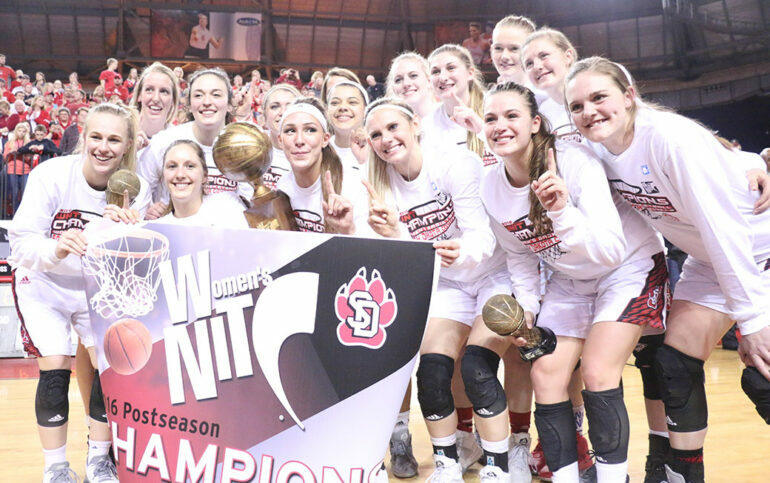 The title run was also a fitting send off to the DakotaDome, as the WNIT title marked the final basketball game played in the arena. Senior Nicole Seekamp was named MVP of the tournament and Hemiller was also named to the all-tournament team. In October, USD became just the fourth school to win three straight Summit League titles. The team’s 43 points were good enough to beat second place North Dakota State University’s 48. This was the closest victory of the Coyotes’ past three in the Summit League Championship. The SDSU women came in third with 55 points and IUPUI finished fourth with 101. Freshman Julia Noah was the leader for the Coyotes, and placed third. Junior Erin Wetzstein was right behind her in fourth place. Their performances earned both Noah and Wetzstein first team All-Summit League. Noah also won the Newcomer of the Championship award, as she was the highest-placing freshman. Sophomores Megan Billington and Lindsey Joyce were the next best finishers for the Coyotes, coming in at ninth and 12th respectively. The pair’s performances earned them second team places on the All-Summit League team. Sophomore Madeline Huglen came in 15th for USD, missing the second team by just one spot. The next placing Coyotes were in the 20s. Redshirt sophomore Bethany Kozak came in at 20th, freshman Kianna Stewart at 25th, senior Jessica Feldman at 29th and sophomore Liz Bohn finished just outside of the 20s at 31st. The Coyotes’ strong performances netted head coach Dan Fitzsimmons his third straight Summit League Women’s Coach of the Year award. Wetzstein was selected to the Summit League Academic All-League Team. The Coyote women placed 11th at the NCAA Midwest Regional earlier this month. Last swimming and diving season now senior Greyson Hertting collected her third straight Summit League Diver of the Year award. Hertting is the first woman to accomplish this, as well as the first to sweep both boards in three consecutive Summit League Championships. Hertting currently owns three of the four available USD diving records. She has the first place spot in one-meter dives (six dives), in 3-meter dives (11 dives) and in 1-meter dives (six dives). She is third on 3-meter dives (11 dives). Hertting also owns the DakotaDome pool record for the 1-meter dive (six dives) and the 3-meter dive (six dives). Herrting ended last season with a trip to the NCAA Zone Diving Championships at Texas A&M, a qualifier for the NCAA Championships. Against 52 competitors Hertting placed 32nd in the one-meter dive with a score of 244.75. She then placed 51st in the three-meter dive with a score of 203.45. Hertting’s 21 individual victories in the three-meter dive were a new school record. Early results this season have been good for Hertting, as she was named Summit League Diver of the Week for her record 28th time in her career. After last season’s .500 finish in the Summit League, the Coyotes bounced back with a historic season — their best season since joining the Summit League in 2011. The Coyotes finished at 25-7 overall and went 13-3 in Summit League play. This record was good enough to give the Coyotes a share of the Summit League title with Denver. USD also finished with a 10-1 record at home in the new Sanford Coyotes Sports Center. The Coyotes’ season saw them sweep rival South Dakota State in their home-and-home series and finish runner up to Denver in the Summit League Tournament — just shy of a NCAA Tournament berth. The Coyotes also picked up a slew of Summit League individual awards. Elizabeth Loschen was named Freshman of the Year, junior Brittany Jessen earned Setter of the Year, junior Audrey Reeg picked up Player of the Year and head coach Leanne Williamson was awarded Coach of the Year. Reeg and Jessen were also named to the all-league team, while Loschen was named to the all-freshman team and senior Lindsay Brown received an honorable mention. Following the conclusion of the Summit League Tournament Reeg and sophomore Lauren Mattison were both named to the all-tournament team. The Coyote football team didn’t reach their ultimate goal of making the playoffs, but throughout the year the team showed they could hang with anyone. This was highlighted on Dakota Days when the Coyotes took down then 11th ranked University of Northern Iowa 28-25. It was a back and forth game throughout the day, punctuated by big plays such as the opening touchdown, a 69-yard pass from junior Chris Streveler to sophomore Tacari Carpenter. Streveler would find Carpenter twice more in the game, for 75 and 29-yards in the second and third quarters respectively. However, it wasn’t the Coyote offense that sealed the game in USD’s favor, it was the defense forcing a three-and-out late in the fourth quarter that sealed the game. On fourth down senior Colin Mertlik sacked the UNI quarterback to get the ball back to USD and end the game. This like many of the Coyote games this season was a close one. Only two of USD’s 11 games were decided by more than one score, a 48-21 loss to New Mexico that opened the year and a 30-20 loss to Youngstown State. The Coyotes finished the season at 5-7 and 3-5 in Missouri Valley Conference play. Following the regular season both Streveler and fellow junior Alonge Brooks were named to the MVFC All-Newcomer Team, with Streveler taking home Newcomer of the Year. Streveler was also named to the all-MVFC second team along with senior Jet Moreland. Senior Miles Bergner also received his fair share of recognition, the kicker became the first to be named to the all-MVFC first team as both a kicker and a punter.